Break out the champagne, two posts in two days! All 5 of my readers are spoiled rotten!! First, I would like to start by letting everyone know an update. After a rough couple days Lane seems to have snapped out of her doggy-depression. I think she realized her new BFF wasn’t coming back anytime soon. Some motherly advice, “It’s for the best Lane, just move on, you’re too young to date!” There is also a very tiny slight possibility that she was just sleeping for 2 days straight on the couch to recover from the craziness that was last weekend. I may or may not have been doing the same thing. Now back to the post at hand. After writing about all my amazing friends who have shown my sofa some action this past year, I thought to thinking I needed to do a little “Oh the places I’ve been” post. I must definitely believe I can fly cause I feel like sometimes that all I’ve been doing this year. Starting in mid-January here is a short (or not so short) run-down of the places I’ve been this year. I’d say that’s not too shabby for eight months. Monday I fly to Virginia Beach, VA once again. I’ll be on the ground for a whole 24 hours before flying back. Sometimes I think I must be crazy. There is another trip in the works, a big trip, to top every trip this year, even the free two-week trip to Hawaii and the All-Inclusive “adult spring break” to Cabo, Mexico. Details hopefully coming soon. Wow, has it really been March since I blogged? There isn’t enough space on the blog-o-sphere to fill you in on everything that my crazy self has gotten into. This year, 2012, year of the Dragon (in Korea),the year I turn 30 (gasp!) has also been the year of visitors! As in friends visiting Seattle, hooray! I can’t believe it’s almost September, this year has totally flown by, but maybe that’s what happens when you’re having fun. As my most recent house-guest departed yesterday, and we hugged and said our goodbyes I thought “Wow, it only took three and half years to get people to come visit me in Seattle”, but the friends who have shown my sofa some action in 2012 are the most amazing. Weird to think that only one of these people was I friends with prior to moving to Seattle. One of them I knew but was not “friends” with, one I only met 2 years ago but we became instant friends, and one I just met earlier this year. I was totally excited to have all these friends visit, and I can’t imagine not having them in my lives. I’ve lived alone for 7 years now and I do enjoy my independence, but every time a sofa-sleeping-friend packs up and leaves I get totally lonely. I’m fairly certain that Lane has gone into a deep depression after my most recent friend departed as she hasn’t squeaked her lion toy since he drove away Monday afternoon. I keep telling her that it’s ok, maybe one day she can go visit him but she just looks at me sadly then go right back to sleep. She may just be tired, but I am sticking by my diagnosis of doggy-depression over finding and losing her BFF all in a matter of 3 days. Yes, these are the things going on in my life these days. I’m so glad all these friends came to visit, especially when things around here are about to get CRAZY…but more on that in the next post. Like always I’ll end this with a big fat empty promise to start blogging every single day now, but let’s be honest, if you get another post in the next month just consider yourself spoiled. I make no secret that I’m single, and with being a single gal at the end of my twenties means joining the ranks of online dating. I get messages from guys I respond to, and messages I ignore. I’ve received some weird messages before, and some are just dumb, like 2 weeks ago when a guy wrote to me and said nothing but “Respectfully, I would date the hell out of you”. Really guy? Putting “respectfully” at the beginning of that sentence doesn’t make it any less tacky and stupid. Delete! With all the crazy messages I get today’s has got to be the weirdest of them all, this is no joke, I actually received this in my inbox…. Hello, Washington…. do you copy? We seem to have a communication failure. Interference,perhaps sunspots. An attractive alien has appeared on my radar screen. She is unlike most that I have encountered. She has an out-of-this-world smile, and says she knows the difference between your and you’re. I will try to make contact. Please advise. Is that not the funniest thing you’ve ever read? Hilarious. Needless to say I will not be responding to that one. Thanks online dating for keeping it real and giving me something to laugh about every now and then. DoubleYou.Oh.Are.Kay…work, work work. That’s all I’ve been doing recently. Sure I’ve had times when work has been busy and I’ve worked late hours, etc, but the past month has just been insane. I’ve worked overtime every week since the end of January, and over the past 3 weeks I’ve worked 7-days a week and even pulled two true all-nighters while averaging a whopping 3 hours of sleep ont he nights when I was lucky enough to sleep. All I’ve longed for was a work day where my email was pinging every 20 seconds, where my phone wasn’t ringing every 5 mins, and where I knew that at 5pm I could shut down my laptop and relax. Today was finally that day and all I could think was “I’m bored” and “I really wish I had more emails to respond to and my phone would ring”. I’m afraid that my worse fear has finally come true…I have finally become a work-a-holic. Longing to be busy and feel important by being so busy. I was sooo bored today that I even organized my filing cabinet at the office and did some mega file archiving on my laptop. I should count my blessings though…next week may be boring, but April and May are looking to be crazy as ever…travel and more travel which comes with work work work and more work. Has anyone else been working like a mad-person lately or is it just me?? Back in December, www.thedailybeast.comranked the Best Cities to Find a Date in 2012, ranking the top 25. Now, I feel the “top 25” is a bit misleading as they list cities separately that are a part of the same metropolitan area; for instance Alexandria, VA & Washington, DC or Seattle & Bellevue, Wa. Atlanta topped the list, but looking through the other 24 I realized I’ve either lived/worked in 6 of the cities on the list…all of which I found it extremely hard to find dates in…hench why I’m still single in 2012! Rounding out the top 25…. I also found it interesting that Lincoln, NE was #3…maybe because the people there are so freakin’ nice and there is nothing else to do that everyone just goes on dates all the time. It’s now January 12th (almost the 13th) and for some odd reason I’m having a hard time grasping that it’s 2012. Of course the first couple weeks of every year we all have to think one extra second before writing down the date on something, but other than that a New Year doesn’t normally affect me, but this year is different. I’ve been having a hard time falling asleep since new years because I can’t seem to turn my brain off. Every night I lay in bed, close my eyes then think and think and think. “I want to complete this task tomorrow”, ‘I need to do that this weekend”, “Can I afford that trip”, “Oh, I need to pay that bill”. It’s a never ending dialogue in my head of things I want to do this year, things I want to change in my life. Every January 1st I throw out a couple cliche resolutions like “losing weight” and “saving money” and by January 2nd I’m usually thigh deep into a greasy cheese pizza while shopping online for brand new clothes that I can’t even fit into my already overstuffed closet. I’m sure I’ll kick myself later for declaring this publicly on the internet, but this year just seems different. This might be the first year in my life that I accomplish a few, if not all, of my goals. Maybe that’s why it’s taken me 12 days to sit down and write this post, and 12 days to even declare my resolutions. I haven’t over thought anything or jumped to any bold resolutions just because the date was January 1st. This year I’ve taken time to mull things over, reevaluate my life and quietly decide on things that I want, I need! to change. I think this year feels so different for a few reasons. On December 31st as I stood in front of the mirror primping myself for a calm night out with my family to celebrate the New Year I noticed a few things. I’m fat. Ok, I’m not wildly obese and on the verge of being crane-lifted out of my apartment and rushed to the hospital on a flat-bed truck, but I’m fat. Like, need to lose the 40lbs that I’ve gained since college, fat. I’m old. Yes, my mom is probably rolling her eyes and laughing at this one, but I literally pulled 4 silver-white hairs from my head as I got ready for New Year’s Eve dinner. I could chalk it up to stress (that happens right?) but then it dawned on me that 2012 is the last year of my 20s! Sure, I have 11 months till I hit the big 3-0, but it’s happening this year and as cliche as it sounds turning 30 terrifies me. The whole “What have I done with my life? I thought I’d be so much further along by now.” is a whole other post on its on. I could go on and on about about all the things 10 years ago I would’ve sworn I would have/done by 30. I’m tired. Yes, I’m always tired physically, I could literally nap 3 or 4 times a day like a newborn baby, but that probably has a lot to do with #1. This kind of tired is different. I’m tired of settling. Settling on my job, sure it’s a job, it pays descent, but is it really what I want to be doing for the rest of the my life? Is my career going anywhere? Sometimes I feel like I’m on a hamster wheel running furiously but not going anywhere at all. I’m tired of doing the sames thing over and over, my life sometimes seems so monotonous. Wake up, eat, work, nap, eat, drink, watch tv, shop, sleep, repeat. I need some variety. I need to try new things. So there you have it, it’s 2012 and I’m fat, old, and tired. Haha, saying it like that just sounds hilarious. Don’t take this as a depression post. Don’t worry, I’m fully aware that although I’m fat, old, and tired, I’m also young, lucky, and blessed. I’m young and have a lot of life left to live. I’m lucky to have a steady job in a time when a lot of people don’t. 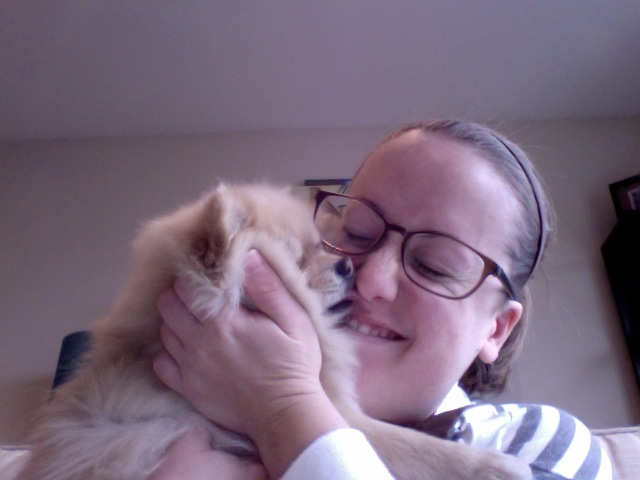 I’m blessed to have amazing family, friends, and my fluff ball Lane in my life. Sure I haven’t officially declared any resolutions here, but maybe that’s why I think this year will be different. Maybe I’ll have a much better chance of accomplishing my goals without typing them permanently on the internet to haunt me. This is the year…2012, the year of Maria! Yes that word cloud in the background is awesome…I’m thinking about making one as a piece of art for my apartment… but the real centerpiece is that sweater. Yes, it’s a sweater with a skinny tie on it and yes I love and yes I want it. 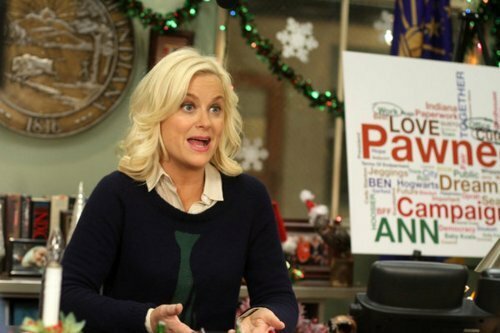 I’ve been googling my heart’s content for an hour now and can’t find anything remotely close…but if Leslie Knope is wearing it, it must be available somewhere. I must have it. I realize as I lovely gaze at this masterpiece of a sweater that not only is is ironic, cool, and awesome, but it also let’s me make fun of the UVA peeps who wear ties to football games every time I wear it. Double-bonus! Someone find me this sweater… please! A great big Happy Thanksgiving from myself and Lane. This Thanksgiving morning I sit on my couch, still in my totally awesome Korean apron covered in flour, as Lane sleeps cuddled up next to my leg and I patiently wait and hope that the dough rises on these rolls I’m attempting to make from scratch! I can’t remember the last time I sat down at a table for a family Thanksgiving, maybe 2007 or 2008? Yes, it’s been that long. Last year I was half way around the world eating spicy chicken at a chain restaurant in Korea. This year, even though I’m 3,000 miles away from my immediate family I will still have a semblance of a proper Thanksgiving, with family and friends. I called my mom this morning, and as she told me I was on speaker phone and I heard the chorus of “Hello’s” from the background it made me sad. Sad that I’m far away, sad that a flight home was more than I could afford, and sad that I’ll miss the home-cooked food with my parents, aunts, uncle, and cousins for one more year in a row. But on today of all days, I shouldn’t be sad, I should be glad, and thankful. Thankful that I have family in Seattle, thankful that my friends and family who are also 3,000 miles away from “home” are gathering with home cooked food and sitting down for our version of Thanksgiving. In a time in my life when my career, finances, and personal life might not be in the state I’d like them to be, it’s hard to sit back and see the good, but today I will. Today I will finally refuse to be anything but thankful. I’ll keep the tv off, listen to my christmas music softly in the background, as I look out on the rainy weather and cuddle with Lane on the couch. I’ll head to my cousin’s home and enjoy the afternoon with 2 bouncing toddlers, the world’s largest and smallest dogs, and of course friends and family at the dinner table. We’ll talk, we’ll laugh, we’ll drink and we’ll eat, oh goodness, we’re gonna eat! Even on the grayest and rainiest of Thankgiving days in Seattle let’s all be Thankful! From my tiny family to yours, HAPPY THANKSGIVING!